How expensive is it to raise a child? Just how expensive is it to raise a child? Ready for some child-raising sticker shock? We knew it cost a lot to pay for it all — the diapers, clothing, preschool, babysitters, school supplies, activities, electronics and driver’s ed — but, we weren’t ready for these numbers! The USDA recently published their annual Expenditures on Children by Families report (based on 2015 data). According to their Cost of Raising a Child Calculator, the average two parent household earning between $59,200 and $107,400 spends approximately $16,100 to over $17,600 each year to raise a child, depending on age. And, the more we make in our household, the more those costs go up. Having trouble paying for unexpected child expenses? 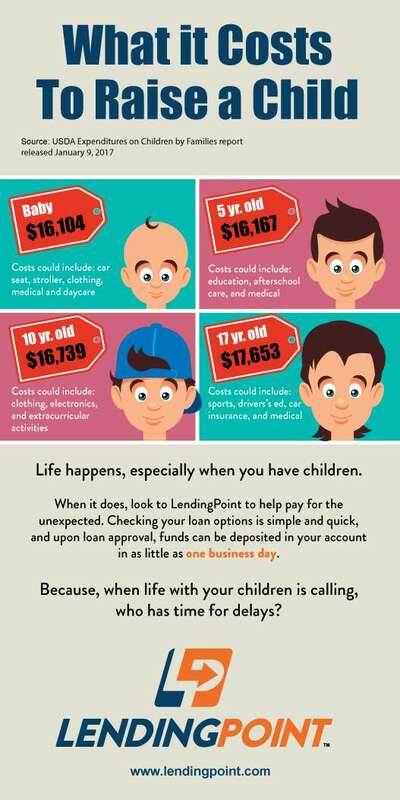 A LendingPoint installment loan can help. With one consistent monthly payment designed to fit your budget, one of our loans can bring you peace of mind. And, did you know that installment loans are better for your credit score than revolving credit? Apply now for your personal loan, and in less than a minute you can see what you qualify for.